How do I use the serial key file? When you start the application unregistered, the registration wizard appears. From this dialog you can choose the registration method you would like to use or to continue and try GrandVJ 2 or GrandVJ XT in Demo mode. 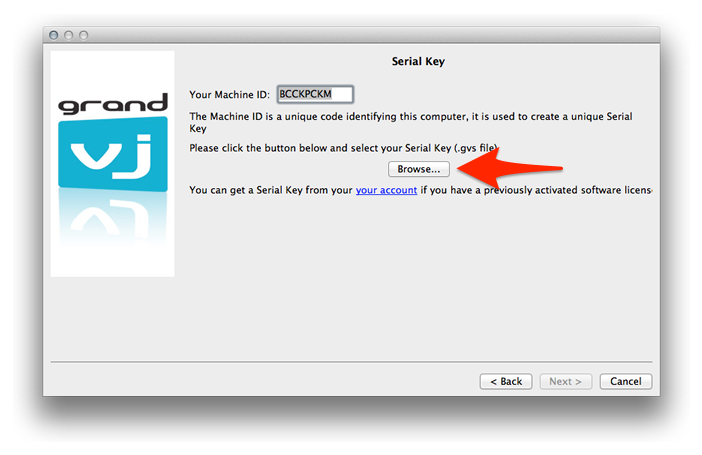 For your information, your computer’s Machine ID is displayed at the bottom of the dialog; you will only be able to unlock GrandVJ with a Serial Key that was generated for that Machine ID. Choose the option "Serial Key"
Choose the second option "Serial Key" to activate the software manually with a Serial Key. 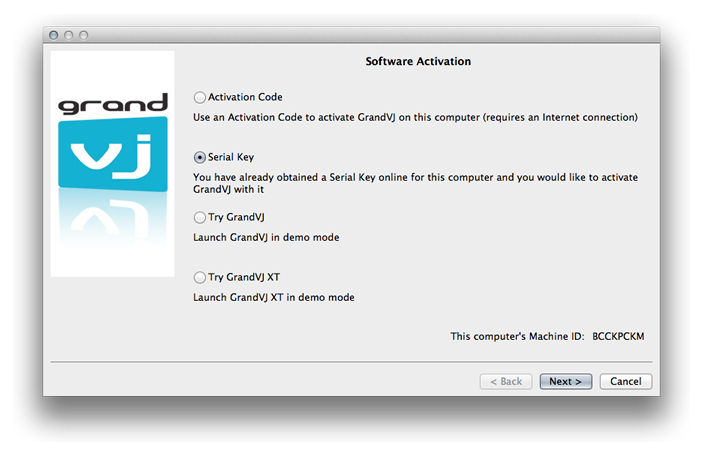 This is useful if for any reason you couldn’t go through the activation process from within the software, you can register your Activation Code manually on the ArKaos web site and download a Serial Key from your customer account to use it to activate GrandVJ. This option is also useful if the computer where you want to unlock GrandVJ is not connected to the Internet. In that case, you will need to surf to our web site with another computer - connected to the Internet - and generate a valid Serial Key for the computer you want to run GrandVJ on. Remember every computer has a different Machine ID and a Serial Key will only unlock GrandVJ on the computer with the corresponding Machine ID. Important: before surfing to our web site to obtain a Serial Key, make sure to take note of the computer's Machine ID (displayed at the bottom of the registration window) and have your Activation Code ready. With a web browser, go to http://www.arkaos.net/register/ and follow the instructions there to create a new customer account (if you don’t have one already) and obtain a Serial Key for your Machine ID code. After completing the registration process online you can download your Serial Key from your customer account’s “My Licenses” page, it’s a file named “Serial.gvs”. Transfer it to the computer where you wish to activate GrandVJ i.e. 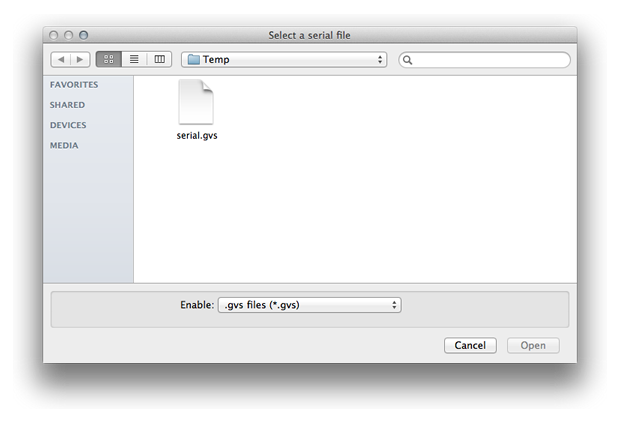 by using a USB key then, from GrandVJ’ Serial Key screen (below), browse to the “Serial.gvs” file. 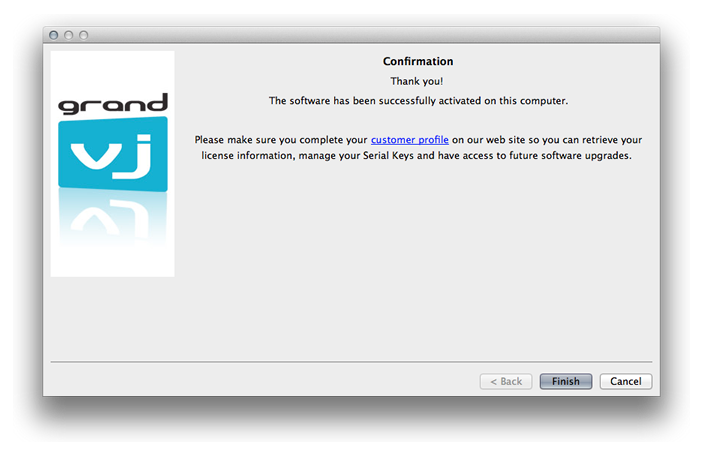 Once you have loaded your Serial Key, you will see a confirmation message and your software will be activated.